Recently we had a family gathering. I brought bubbles for the grandchildren. They like to play with containers of soapy liquid so they can make a thin film forming a hollow globule around air, or just blow bubbles. I also like bubbles, so when they play so can I and we all have fun. Sometime during the winter, I found a bargain. It was a telescope. I decided to purchase it so when our grandchildren visit during the summer they will be able to sit outside in our backyard and look up at the night’s heavenly bodies. It seemed like a perfect activity that could be enjoyed by all ages. Of course, I couldn’t just leave the telescope in the box for months. I had to unpack all the pieces and check things over. It wouldn’t do to wait and find that pieces were missing. And as long as I had all the bits out on the table, I might as well put it together. I called Bob to help and soon we had the telescope standing. Then it was time for us to check to see if it worked. Freezing temperatures kept us inside, so we pointed it out the window and tested to see what we could see. That first day we didn’t view much. It was snowing and nothing but white was visible, except close up in our yard. The next day I pointed the telescope out the window again. I couldn’t see anything, which puzzled me because it wasn’t snowing. That’s when I found out I had the gadget pointed up into the overcast sky. When I tipped it down I eventually found tree tops and then land. Both Bob and I were amazed how far we could see and how sharp an image we had. I had only paid $15 for the telescope, but it brought our farthest field, a half-mile away, up close. I had a hard time finding my way across the field though. When I thought I was scanning to the right, I was actually moving the telescope to the left. Having it mounted on a pivot took a while to get used to. After much practice, I’m able to find my way around our fields without much trouble. Oh, I still wander a bit, but every time I use the telescope I get better at finding the location I want. There wasn’t much to look at when our world was winter-white. Even wild animals weren’t wandering through our neighborhood. As time progressed, though, we’ve found critters we could target. First deer began to appear and paw through the snow in our wheat field, looking for something to eat—our winter had been extra hard on animals. It was nice to see any sign of wildlife at all, even ones that tend to nibble on our tender crops when we don’t want them to, which is most of the growing season. The following day four turkeys were added and then sandhill cranes arrived. We were glued to the window. One of us was on the telescope, while the other had the binoculars, and then we’d switch. As we stared out the window I started wondering what people who drove past saw. From our position, we couldn’t see any other building, not even our closest neighbors, but it would have looked odd from the outside. If we lived in town, it would have been much worse. 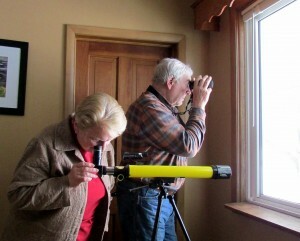 Standing by our window with binoculars and telescope would look like we were spying on our neighbors. “No, we’re not spying on you. There was a redheaded polly-wolly sitting in your birch tree.” Or “I’m not peeping. I was just trying to figure out what that shiny thing was hanging in your tree.” If I keep writing about using binoculars and a telescope like this, no town will allow us to live there. That or all our neighbors will draw all their blinds and shades … or get their own binoculars and telescopes. In the end, we could start a stargazer club. I guess it’s a good thing we live out in the country. When the grand kids come they will be able to search the sky or the horizon and no one will care….at least I’m pretty sure no one will.